Bridges and port wine are what characterises Porto, Portugal's gracious northern capital and second largest city after Lisbon. 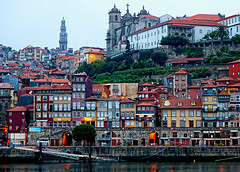 Porto sits astride a great gorge at the point where the River Douro enters the Atlantic. Although it is mainly industrial, the city centre has plenty of charm with art treasures, medieval cathedrals and museums. The narrow streets sport wrought-iron balconies decorated with splashes of potted geraniums.